We're tired of keeping up with the drama between Steve Saleen and the company bearing his name, but this Saleen 435S Mustang is the first all-new offering from the Steve-less 'Stang customizer. Much like the car's direct competitor, the Roush 427R, the Saleen 435S has supercharged the 4.6-liter V8 for 435 HP but bests it with 425 lb-ft of torque, 25 more pounds of twist. The car doesn't get much in the way of visual upgrades, but it does have new wheels, mesh covered fog lamps, the requisite "Saleen" badging and option chin and tail spoilers. No word on pricing, but we're betting it's right in the Roush's $43k ball park. 2010 ROUSH 427R Mustang: Live Unveil Of The New 435 HP Boy Racer! 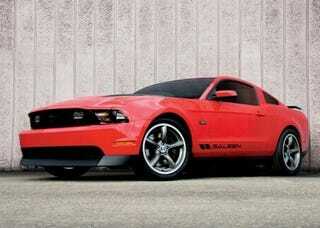 Saleen Performance Vehicles today unveiled its first 2010 product, the Saleen 435S, based on the new 2010 Ford Mustang. The introduction took place as part of the Special Vehicle Team Owners Association's annual "Mustang Week" event. The 435S is the first vehicle launched under Saleen's new ownership, following the purchase of Saleen Inc. earlier this year. This car continues the Saleen tradition of offering limited-edition, high-performance vehicles for enthusiasts who are looking for an exhilarating driving experience, with refined drivability for real-world road conditions. The 435S is designed to provide affordable, high-value performance. "In these difficult economic times we wanted our first vehicle to deliver a lot for an affordable price," said Mike Shields, CEO of Saleen Performance Vehicles. "It was created much more for ‘go' than for show. We focused on power and handling, and it's a great platform to build on if a customer wants to take it farther later on." Heart of the car's performance is its 4.6-liter, 3-valve SOHC V8 engine, complete with a Saleen Series VI twin-screw supercharger and two-stage intercooler. This engine produces a vigorous 435 horsepower and 425 lb.-ft. of torque. It's mated to a 5-speed manual transmission, and has a 3.73:1 rear axle ratio with limited-slip differential. The car rides 1.5 inches lower than a Mustang GT, thanks to its Saleen Racecraft performance suspension. The system is designed to reduce body roll, provide nimble, precise handling and improve traction, while retaining the compliant ride of a good daily driver. The suspension package includes springs, a stiffer front stabilizer bar, and nitrogen-pressurized shock absorbers tuned exclusively for the 435S. The vented brake rotors, front and rear, are slotted and cross-drilled for improved feel and stopping performance. Larger, 14-inch slotted front rotors with 4-piston calipers are available as an option. The 435S has the Saleen-signature long, low, sleek looks and aggressive stance that have distinguished the company's previous cars. Traditional Saleen styling cues include an understated trim panel between the taillights with "Saleen" in raised lettering, mesh covers over the fog lights in the grille, and the Saleen name and chevrons as graphic elements placed low on each side. An optional Aero Package includes a lightweight chin splitter and rear spoiler for improved aerodynamics. Other exterior highlights include unique, 18-inch, 5-spoke alloy wheels (19- and 20-inch wheels are available), and "435S" lettered on each side of the hood's power dome. Inside, the modifications are designed to enhance the driving experience and to express the car's character. These include a new, short-throw shifter for quick, precise gear-changing performance, and new, driver-oriented gauges. These uniquely styled gauges retain Mustang's MyColor™ capabilities that allow the owner to select from more than 125 custom colors for the instrument cluster. The car's identity is highlighted by a Saleen logo embroidered on the headrests. "All in all, we believe the 435S is the right car at the right time," said Shields. "It's a terrific performance value that we're proud to offer. And this is just the first of many great Saleen vehicles we'll be launching in the future."